No one has immunity in the annual review process. From interns to c-level executives, almost all companies give their employees a chance to reflect on their performance at least once per year. So, what’s the key to reducing the stress of your review? How can you ensure your review is a success and you get the raise you deserve? Simply put: preparation. If you prepare for your review well ahead of time instead of scrambling the night before, you’re setting yourself up for a positive conversation. That’s what this post is here to help you do. This timeline will allow you to stay organized and present your best self when you sit down for a performance evaluation. Here are the steps you need to take before your annual review to get prepared, reduce stress, and ensure success. When the heat is on, it can be tough to remember the impact you’ve made on your organization. Scanning your calendar and email at the last minute for success stories often means you’re leaving out key contributions that deserve recognition from leadership. That’s where keeping an ongoing journal of your accomplishments can help. Instead of pulling together only what you can think of at the moment come review time, a weekly journal arms you with plenty of examples of your big wins throughout a review period. Say, for example, you’re working as a web developer. You might be able to easily recall some of the big projects you’ve worked on over the last quarter or two, but it’s difficult to remember some of the smaller wins you’ve contributed to on your team. Reviewing what you’ve accomplished on a weekly basis. Are there projects where you added key insights or contributions? Can you now, in hindsight, tie any of your contributions to the future success of that project? Pull that information from those weekly journal entries. You’ll use it later to boil down your successes into 5-6 key wins that demonstrate your value. Take the information you pulled from your weekly entries and tie it to hard data. If a particular project you worked on later resulted in a boost to a key company metric, be sure to make a note of that and align it with your contributions. Put it all together in a report to share with leadership. Don’t leave your wins up to your boss’s memory and interpretation. Always come to your review armed with a written self-evaluation. That way, there’s no question about the projects you were involved in and the impact you made on their success. Jot down quick notes throughout the week as reminders. Make it a goal to record one small win each day on a post-it note. It may be as simple as “submitted a first code draft of the new landing page” and that’s OK. A win is a win, and while that first draft may seem small at the moment, you won’t know until reflecting later the impact it may have had on the success of a project. Set a designated 10 minutes weekly to complete it. It will be easy to deprioritize journaling your accomplishments in favor of tight deadlines or bigger projects. Try to respect your time whenever possible. By keeping the commitment short (10 minutes should more than suffice) and putting it before something you’re looking forward to (like lunch or leaving for the weekend), you’re more likely to stick to it. Don’t worry about spelling or grammar. This journal is for you – worry about using correct English in your self-evaluation. For now, focus on getting down the ideas. Rule of thumb: if you can read your chicken scratch, it’s good enough. There’s no better time than the months leading up to your review to get involved in more projects that fall outside the scope of your daily responsibilities. For example, you could join a mentoring program for new hires, solve a nagging problem that’s plagued the team for some time (but no one has ever gotten around to solving), or get involved with enhancing the office culture. Choose something that’s exciting to you. Frankly, it doesn’t matter so much what you’re doing, just that you’re doing something. Make it a goal in the two months before your evaluation to boost your visibility within your organization tenfold. You might be wondering: Shouldn’t I be getting involved with stuff like that throughout the year? Why consolidate to the last two months before my review? Yes, of course, long-term involvement in extra projects is a good thing. Sadly, that doesn’t mean you’ll always receive recognition for them in your review. That’s because people have a tendency to base appraisals off their most recent impression of a person. Psychologists call it the recency effect: a bias toward the manager’s most current perspective of your work. It’s one of the most common biases in the annual review process, and while there’s a lot your manager can do to overcome it, the reality is many do not take those steps. As the employee receiving a performance review, you have two choices: fall victim to the recency effect or take advantage of it. Are you gaming the system a bit by backloading all of your extra-curriculars? Sure, maybe a bit. Does it make those contributions any less valuable? Absolutely not. You still do the work. You still put in the effort. You’re just trying to ensure you receive credit where is due by staying aware of inherent psychological biases that may be outside your control. Expanding your skill set in the month or so before you sit down with your manager does two things. First, it plays into that recency effect discussed in that last section. Just as getting involved with projects that benefit the company will be looked at positively, so will efforts for self-improvement. Second, it increases your personal “stock” a bit and makes you more valuable. Say you’re a senior systems engineer. Sure, you’re a genius with the skills needed to succeed in your current role, but perhaps you start looking at some leadership development courses to expand into people management. All of a sudden, you’re not just a valuable player on the systems engineering team; you’re someone who may be top-of-mind when the team needs a new manager in the future. Paysa should be your go-to source for identifying what specific skills are worth developing for the job you want in the future. You can search for a particular position, find relevant salary data, skill, and demographic information. 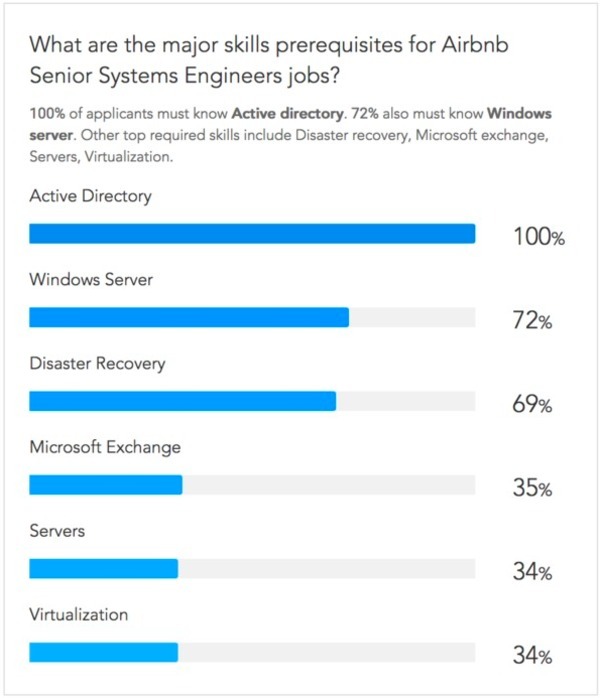 For a senior systems engineer at Airbnb, 100% of people in his role have active directory experience, but only 34% are strong with visualization skills. That could be a significant area of focus come review time. Skills breakdown for senior systems engineer at Airbnb, per Paysa data. Complete your self-evaluation. Armed with your performance journal, go through and compile 5-6 key wins you feel best reflect your contributions to the team and company over the last year. Remember: data is king. Don’t leave your successes open to interpretation. If you present hard data along with your wins, it will be impossible to deny the impact of your contributions. Reflect on your goals for the coming year. Let’s say you implement all the advice in this article and your review goes great. Well, now what? Sure, a celebratory margarita may be in order, but your boss is going to want to know your game plan for the next 12 months. Think about what you want to accomplish and how you want this review conversation to sound a year from now. Are you in the same role? Have you been promoted? Are you working on more challenging projects? Only you can decide what the future holds, but your boss isn’t a mind reader – share the information so that they can help you get there. Put together questions for your manager. Just like a job interview, showing up without questions could mean an awkwardly short and unfulfilling conversation. Don’t expect your manager to come to the table armed with a bunch of ways to get the dialogue going. This is your review. Take charge and make sure you’re getting the maximum value from your time together. Evaluate your current salary on Paysa. Just as Paysa can help you uncover opportunities for skill building, you can use the site to evaluate your current position and determine if you’re in a position to negotiate a raise. Paysa provides a custom report to determine whether you’re underpaid for your hard work and contributions. Create your own report and bring it with you to your review to get the negotiation process going. By leveraging Paysa and putting this timeline to action, you’re setting yourself up for a stress-free, successful review process. And when you finish the review, check out a recent post on the Paysa blog, “5 Steps to Take After Your Annual Review” to learn the next steps in the evaluation process. Next ArticleWho's Hiring For the New Space Race?